This third act of Die Walküre was recorded during the first Bayreuth Festival after the war, now under the leadership of Wieland and Wolfgang Wagner. It was a year that also produced the legendary Parsifal recording under Knappertsbusch, a likewise legendary Meistersinger under Karajan and Beethoven’s Ninth Symphony under Furtwängler – the latter being the opening performance of the festival. Of the Ring all that was issued at the time was this third act. It is interesting for several reasons, one being the opportunity to hear more than a glimpse of the fairly young Karajan almost two decades before he recorded the complete Ring under studio conditions for DG. By then he had mellowed and presented ultra-refined playing by the Berlin Philharmonic. Compared to Solti’s spectacular Decca cycle – the two super-maestros overlapped more or less with Die Walküre, Karajan tended to pale. This was also down to his choice of soloists, who, in line with the elderly Karajan’s approach, were excellent but generally a size smaller than Solti’s supercharged giants. Thus Solti’s Sieglinde, Régine Crespin, appeared as Brünnhilde, while Gundula Janowitz who was at that stage still very much a Mozartean, sang Sieglinde. Thomas Stewart, however deep-probing and articulate was undoubtedly a size smaller than the magisterial but somewhat shaky Hans Hotter for Solti. All that said, in 1951 he had at his disposal three singers who were, or were to become, legends in their respective roles. At this stage Karajan was also a more thrilling, more spontaneous conductor, less polished perhaps but more exuberant. The Ride of the Walküre, for instance, has a vitality that is absolutely stirring. Through the rest of the act he in turn urges on and holds back his singers to capture the ebb and flow of the music and the drama. Sometimes he is almost too eager. The opening words of Wotan’s final monologue, Leb’ wohl, du kühnes, herrliches Kind! are almost drenched by the orchestra, but that is a small price to pay for the intensity of the performance. The concluding Magic Fire Music is played with immense power and beauty. The sonic quality is hardly competitive, not even with the Keilberth Ring, recorded just five years later and recently issued on Testament in excellent stereo. For its age it isn’t bad, however, and in spite of the limitations of dynamics, frequency range and mono recording it gives a good aural picture of what was happening on the Bayreuth stage – and in the pit. There are some stage noises, but far less than on many later live recordings. There are odd patches of coughing from the audience, but in the main they are very well behaved. The eight Walküres are a fine breed with an especially impressive Gerhilde in the otherwise completely unknown Brünnhild Friedland – a fitting name for a Wagner soprano! In general I am none too fond of this first scene. In some performances with an insensitive conductor the end result can be more squealing than singing. This octet is in the main palatable. It is, however, for the three main soloists that one wants this recording. Leonie Rysanek, only 24 at the time, was a sensation and continued to be in the top flight for several decades. In act 3 she has little to sing, but what she has is gloriously done. Track 3 on this disc opens with her Nicht sehre dich Sorge um mich and her final outburst, at the end of the track, O hehrstes Wunder! Herrlichste Maid!, is something for the desert island. She sang the role three years later in Furtwängler’s complete studio recording but then she was in uncharacteristically occluded voice during much of the first act, where of course most of her role is located. She was much better on Böhm’s Bayreuth recording for Philips from the mid-1960s. Here though, with the freshness of youth, she makes a very believable young mother-to-be. Astrid Varnay had, since her sensational Met debut ten years earlier, become the supreme Hochdramatische soprano, by the side of Flagstad who was nearing the end of her luminous career. This was before Birgit Nilsson hit the international scene. Still only 33 there is no denying that her diet of heavy roles had already started to take its toll. War es so schmählich (tr. 6) is a bit gushy and not absolutely steady. She can be shrill and over-vibrant at times but her involvement and expressiveness is never in question. O sag, Vater! sieh mir ins Auge (also tr. 6) is inward and beautiful and then expands magnificently. During the early 1950s she recorded several scenes from Wagner operas for DG, in several cases partnered by Wolfgang Windgassen. I collected these on LPs and they still have an honoured place – though severely worn by now – in my collection. Here, spurred by the live occasion, she is even more engaging. Maybe the best reason, though, for acquiring this disc is Sigurd Björling. He was Swedish, born in 1907 and not related to Jussi Björling. He had a long career at the Stockholm Opera in a wide variety of roles for more than thirty years, making his debut in 1936, mainly as a Wagner specialist, an international one. His was a true baritone with ringing top and superb articulation of the text. Both vocally and scenically he had tremendous authority. I was lucky to hear him in Stockholm more than twenty years after this recording, when he guest appeared as Wotan and Der Wanderer. By then he was 65 and his delivery was rather laboured. That said, the authority, the power and the declamation were unimpaired. In the sparse, minimalist staging by Folke Abenius and Jan Brazda his was a towering, formidable ruler of Walhalla. Most Wotans are bass-baritones or even pure basses, which vouches for weight and gravity. Often this also means that the uppermost register poses problems and can result in barking. Björling’s brilliant top allows him to sing Du meines Herzens heiligster Stolz! (tr. 9 – just a few bars into the Leb’ wohl monologue) with a freedom and natural flow to cap any other performance I can remember. He also has nuances aplenty at his disposal. He sings Der Augen leuchtendes Paar (tr. 10) with subdued warmth and almost a tear in the voice. At the same time there is no lack of depth and he characterises all Wotan’s mixed feelings. He is formidable in his anger in scene 2: Wo ist Brünnhild’, wo die Verbrecherin? (tr. 4) and one can see his distorted face when he snarls: wie ihren Wert von sich sie warf! He may be over-emphatic in his evocation of Loge (tr. 11) but he is certainly magnificent in his final words: Wer mein Speeres Spitze fürchtet, durchschreite das Feuer nie! That Sigurd Björling isn’t better known today is, no doubt, due to the lack of recorded evidence of his greatness. He made recordings in Sweden during the 78 rpm era but this is, I believe, his only commercial international recording. As always with GROC issues there are lavish documentation, photographs and full texts and translations in English, German and French. 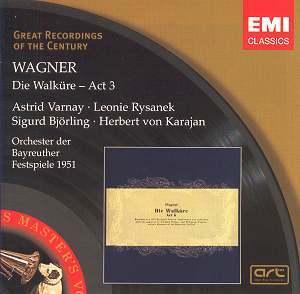 Of historical Wagner recordings the first act of Die Walküre, with Bruno Walter, Lotte Lehmann and Lauritz Melchior, is a classic. This conclusion of the same opera should have the same status. Not to be missed!